May 2010 is when his age is 44. Between the ages of 38 and 44, the 1st (Self) House in transit, @, is in Pisces. In relation to @ is in Pisces, Jupiter (5) is the Ruler of the 1st (Self) House. In the birth chart, Jupiter (5) is especially strong in Exalted position in Cancer, the 5th (Children) House from @. This is the Special Position of Plenty for Lagna in Pisces, an Aquatic sign, the first indication of success. In relation to @ is in Pisces, Jupiter (5) is also the Ruler of the 10th (Career) House. In the transit chart, Jupiter (5) is strong in Ruler position in Pisces, in conjunction with @ and opposite to Lagna. The planet representing both career and sudden luck can reach both versions of self. In relation to @ is in Pisces, Saturn (7) is the Ruler of the 11th (Luck) House. In the transit chart, it is in conjunction with Lagna. The planet representing luck has reached self. Saturn (7) together with Lagna is also the Special Position for Lagna in Virgo. In relation to @ is in Pisces, Mars (3) is also the Ruler of the 9th (Exaltation) House. In the transit chart, Mars (3) is in Cancer, the 11th (Luck) House from Lagna. Mars (3) in the fifth House from @ is also the Special Position of Plenty. This book is written in 2009. 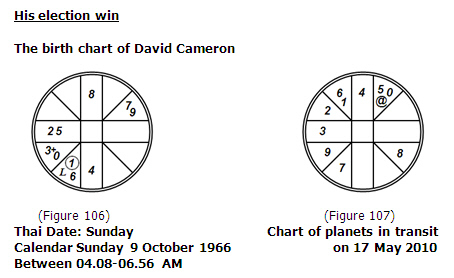 If the birth time that we estimated is correct, we see him becoming Prime Minister in May 2010.